Looking to grab a new Google(s goog) Chromebook without breaking the bank? Two recently released models are definite contenders for your money: The $249 Acer Chromebook C720 and the $279 HP(s hpq) Chromebook 11. Both are new but one actually uses a chip from last year. If you guessed the lower-priced one, you’d be wrong though: It’s the HP model that keeps the 2012 ARM-based chip inside. That makes the less expensive Acer C720 with its next-generation Intel(s intc) Celeron chip the easy choice, right? Not so fast. I’ve been using both models for the past two weeks and if I had to buy one of these two, my choice might surprise. Here’s a quick look at the base specifications for each device. You can see that they’re pretty evenly matched on most. The Acer uses Intel’s latest chip built on the Haswell architecture, providing both solid performance and battery life. HP — or perhaps Google since it collaborated on the design — opted for last year’s Samsung chip typically found in smartphones and tablets. Acer gets the nod here for the better silicon inside. HP surely wins out on the display, however: It’s far better than the Acer panel with vibrant colors, better viewing angles and, even though the resolution is the same, sharper text and images. Neither rivals the 2560 x 1700 resolution display on my Chromebook Pixel, but the HP is much closer to it than the Acer. Acer fights back and wins in the battery life department, however. I’m generally getting 8 hours of usage on a single charge with the Acer C720. For the same type of use, I get close to the claimed 6 hours of run-time on the HP Chromebook 11; typically a bit more than 5.5 hours and once over 6 hours. There’s no doubt that using Intel’s newest Celeron was a smart move by Acer. In benchmark tests, the device tests at roughly twice as fast as the HP model. And real-world performance reflects those scores: Everything happens quicker on the Acer unit. Benchmarks aside, you’ll see the performance benefit of the Acer if you were to duplicate your tasks on the HP. This shouldn’t surprise since the HP uses the same chipset in last year’s $249 Samsung Chromebook, which is a disappointment and missed opportunity. The extra memory in the Acer will also allow for more open and active tabs than the HP. I didn’t notice any performance hit on the C720 until I had opened a good 20 tabs; not a standard practice for me but done for testing purposes. In contrast, the HP will bog down around 10 tabs as the lesser amount of memory gets gobbled up. Ah, but what about other aspects and intangibles? At this point, you’re likely saying, “Wow, the Acer is $30 cheaper and a better performer so it’s definitely the winner, right?” I’m not so sure due to some other aspects and the overall experience after using both devices for several days. Although I value performance, I’d personally choose the HP Chromebook 11 for a few reasons. The build quality and design of the device is much better. As I said recently on our Chrome Show podcast, the Acer fells like a cheap notebook or a re-purposed netbook. It looks and feels very plasticky, the trackpad is very noisy when you click it and the keyboard is average at best. Surely, personal preference comes into play here but the HP design is much nicer, looking like an older white Apple(s aapl) MacBook with fit and finish to match. The trackpad is much better and after days of typing, I actually like the HP keyboard better than that of the Chromebook Pixel. It’s that good. I’ve already mentioned the superior screen on the HP so I won’t rehash that, but when I think about devices, there are two main aspects I’d consider: Input and output. Input is the keyboard and trackpad while output is the display. Both are better on the HP and those are what you’ll be using all day to create and consume data. Yes, you’ll do so slower due to the Samsung chipset in the HP, so if performance is what you’re after, the Acer will win out. One other interesting observation: The HP charges with any micro USB cord so you can effectively re-charge it with the same charger you have for your phone. Or you could carry the small charger HP includes with the Chromebook 11, which charges the laptop over micro USB in less than 3 hours and can recharge a phone at the same time through one of the USB ports. I mention this because it makes the HP a little easier to tote around. The Acer has a much larger proprietary charger. Heck, even the Pixel has one of those; maybe that’s why I enjoyed carrying the HP in San Francisco last week. Ultimately, there is good and bad with both of these low-cost Chromebooks. And there are likely more new models right around the corner. If you’re in the market, I’d recommend getting some hands-on time with any and all of them because there’s something to be said for a device outside of its hardware specs on paper. When you bought a windows laptop you bought a windows as well. Then you need to buy office, virus scanner and a lots of other software what you need for everiday use. So how much is that cheap windows laptop cost you? Chromebook comes with Google cloud softwares, no any virus etc. Ready to use out of the box and if you need something there is the chromestore. Nice post here. I have a Chromebook 11 and think about returning it every day. Its just so unique and fun to use, but it lags in all the benchmarks. Arrgh! It’s possible to change the 16GB ssd, with a more spacious unit or ssd it’s soldering on the mainboard? I own an Acer C720 and my friend has a HP Chromebook 11. I’ve used the trackpad and keyboard on both and I prefer my Acer C720. 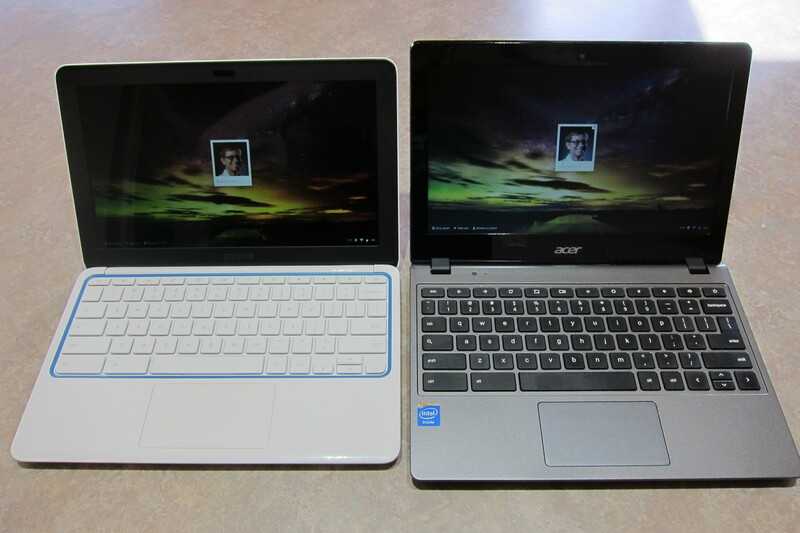 Read my full HP Chromebook 11 vs Acer C720 review to get another opinion. – I have a HD monitor, would HDMI upscale the footage? – If the Intel processor is 1.4 vs 1.7 GHz why is it faster? – Is there a big difference with 2 – 4 GB of ram when less tabs are open? just bought the Hp Chrome white with blue laptop and absolutely love it :D Easy to set up, bright colors, Very light to carry and does not feel like plastic. I love how the stripe on the cover lights up when the laptop is on. There are compromises with each one, which is exactly why I am going with the HP Chromebook 14. Above average design with performance better than the C720. And it has a bigger screen! Typing this on an hp11, having returned the Samsung yesterday. Way better. The keyboard, trackpad, shape of the chassis, rigidity, screen, thoughtfulness of design and general tighness…all those. Jim, zram is actually enabled by default now in Chrome OS, so the HP is already taking advantage of it. I appreciate you sharing your insights about the new Chromebooks from HP and Acer. I have had a chance to play with the HP, but not the Acer because it isn’t shipping yet, so I found your comparison valuable. While I agree the HP has a beautiful design, excellent build quality, and a nice keyboard, its lack of RAM and slower processor are disappointing. I also personally can’t stand glossy-finish screens, even though I agree the HP’s IPS display is sharp and vivid. I regularly have 20 to 25 tabs open in the browser so I was looking forward to the Haswell-architecture Celeron and 4 gigs of RAM inside the Acer, as well as the matte-finish screen. I’m sorry to hear you didn’t like the Acer screen more. That’s good to know. Also, thank you for sharing the info about HP’s Chromebook 11 charger. I didn’t realize it could recharge the battery completely in three hours. I read a review elsewhere raising concerns that charging via MicroUSB would be much slower than via a conventional power supply. Great to know it isn’t with the HP. Overall, I’m frustrated by all of the trade-offs in the Chromebook arena, even though I’m sold on the overall Chrome experience. I have owned a Samsung Chromebook and have nothing but praise for its portability, build quality and matte screen, but its limited RAM and processing speed became apparent after a couple months of use. With Chromebooks apparently selling well, I’m disappointed Chromebook manufacturers aren’t making more strides to deliver models that stretch beyond “good enough.” I have been hoping Samsung might introduce a souped-up Chromebook to maintain its leadership position in the market. Does the company have any plans to do so that you’re aware of? Also, I’d be interested about your thoughts on the value of buying a Chromebook versus buying an inexpensive Windows 8 laptop now that the Chrome App Launcher is available. It essentially delivers the Chromebook experience via a single button, and I love it. I’m enjoying it on a 3-pound, 11.6-inch Lenovo touch-screen laptop I bought on sale for $375. Sure, it’s more money, and there are definitely still trade-offs, but its 4 gigs of RAM and 1.9-GHz Ivy Bridge Celeron haven’t disappointed me yet in terms of web browsing and even streaming video. The touch screen, ability to run Windows software, and 500 gigs of hard drive storage are bonuses worth the extra money IMHO and many of the trade-offs. Again, I’d be interested in your thoughts about how inexpensive Chromebooks compare to inexpensive, small Windows 8 laptops with Chrome App Launcher installed. I wish I could afford a Chromebook Pixel because that would be heaven. Hopefully, new more powerful Chromebooks will emerge soon the bridge the gap between today’s entry-level models and the Pixel’s high-end sophistication. Thanks for this post. Informative. If you still have both devices in house and the time then it’d be great if you could post short youtube clips from each using the built in camera/mic on each. That’s one thing I keep looking for from different reviewers but have not seen anyone do yet. hi kevin, nice review, my main use for a chromebook will be surfing the net, watching netflix, love film etc, as the hp 11 has got the better display i was wondering if it will play netflix, love film ok without stutter etc. Kevin: Not sure if you’ve answered this before, but what’s your opinion of cost vs value of the Pixel against the sub $300 Chromebooks? I have the Samsung Chromebook, works OK for 75% of the things I do but the specs of the Pixel have really captured my attention. Interested in your opinion. I love my Pixel; for me it’s worth what I paid. But it might not be the best value for all. If you can find a used one at a good price, it might be worth it as compared to your current device. The speed increase and the super display are much better than the $300 devices. Why google would go with last year’s Exynos chip for this HP chromebook is beyond me, last year’s samsung chromebook with Exynos was slow as hell. And 2GB ram, they blew it. I suspect that Samsung was the bigger factor. Why offer a better chip to a competitor to make their product better than Samsung’s own Chromebook? Why even bother using a Samsung chip? An HP Chromebook 11 with Haswell would have been perfect. Hey Kevin, by any chance you could do a comparison video between these two with the following things being covered? As always, thanks for your coverage of chromebooks. You’re the only one out there who really covers them in good detail and you also have a great mindset into how they are supposed to work which is satisfying to read. Just fyi: the Wifi only HP 14 has less Ram, 2GB versus the 4G version’s 4GB. I might have jumped on it myself if not for that distinction. Definitely go for the Acer. The HP is going to lag during gameplay and it will be excrutiatingly frustrating (and thus distracting him during homework as well). I’m getting the Acer for my mother, as I want her to be able to enjoy Neflix without any stutter. 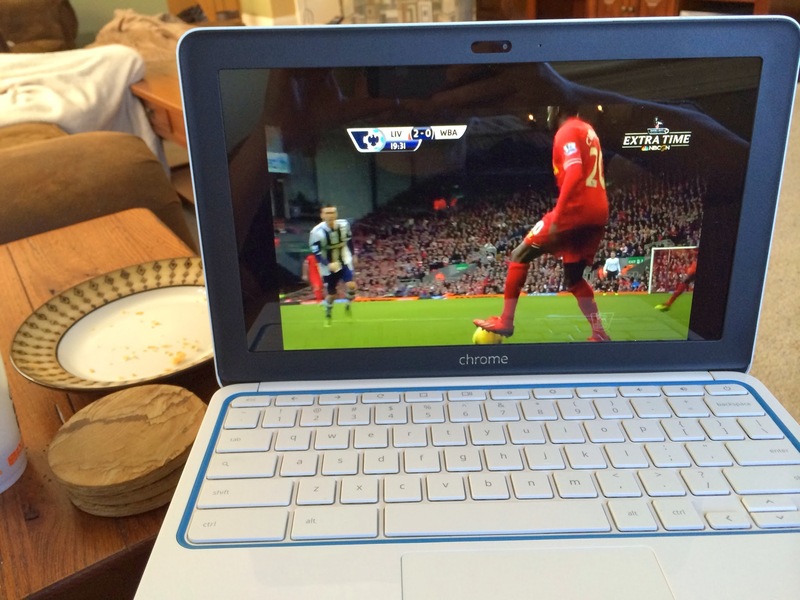 Although I have an iPad mini, I bought a Samsung Chromebook about a week ago – and I think it’s terrific. Each suits a different role. Yesterday I was sitting in a laundromat, and took my iPad due to its portability – but when I need to get some typing done, the Chromebook wins out. Great Points Kevin. I agree with your conclusions. A chromebook is supposed to be a portable device, a tablet with a built-in keyboard in effect. Nobody buys tablets to run 10 apps at the same time and edit videos. People buy them because they are light, portable and convenient. Due to this the HP11 will be a huge success and I can see a lot of macbook pro and imac owners getting them as tablet replacements to take to coffee shops or surf the net on the couch. How is it that you are literally the only reviewer out there who can see that. Well done mate!